It’s always a trip when The Legal Genealogist comes back to California. That’s where I am today and tomorrow, to speak to the Ventura County Genealogical Society and the Jewish Genealogical Society of the Conejo Valley. It’s going to be two great days of genealogical education and I’m looking forward to it. Right now, I’m in Camarillo in Ventura County. But my mind… well, it’s a bit further north… in Marin County. And, to be precise, in San Rafael in Marin County where I spent a few months when I was in the second grade. And, as much as or perhaps even more than anything else, I remember the wonder. Because the months when we lived there in San Rafael were in late 1957 and early 1958. And because I remember being taken out into the backyard to watch what looked to me to be a star, moving across the sky. Now I’m not going to get into the question of whether what I saw was Sputnik itself or its booster rocket.2 Whatever it was, I can still remember standing there in the darkened yard in San Rafael looking up at that moving star. 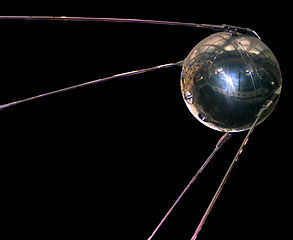 Enjoyed your Sputnik story. As Vice President of the Marin County Genealogical Society and leader of our DNA Group, I want to say that anytime you want to visit us in San Rafael, we would love to see you. Thanks so much, Vernon! I’ll keep that in mind the next time I’m in the area! And everybody here at the Ventura County Genealogical Society were pretty happy to have you here with us today! I know I was. Thank you for four wonderful lectures, Judy! Thanks for the kind words, Don! Great day all around! VCGS was thrilled to have you yesterday! You’ve motivated me to keep digging & not settle with what I found. Thanks so much! Thanks so much, Gayle! Good luck with your research!